Never give in - never, never, never, never, in nothing great or small, large or petty, never give in except to convictions of honour and good sense. Never yield to force; never yield to the apparently overwhelming might of the enemy. 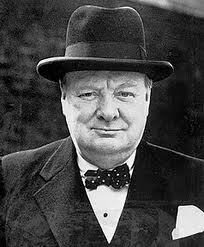 Churchill’s persistence was legendary, but his circumstances were also exceptional. For many of us good sense requires that we do give up from time to time. Are you a quitter or a sitter? When you review your life so far, do you notice that you spent longer in jobs and relationships than your peers? Or maybe you move nimbly from one role to another but sometimes wish that you had stuck at something for longer? Everyone has a predisposition to a certain level of persistence, and if you're persistent in one area of your life the chances are you will be in all of them. But regrets for having stayed too long can be just as powerful as regrets for having quit too soon. Sitters lose time while quitters lose opportunities. If like me you've grown up believing that quitting is a sign of weakness, it's worth remembering that persistence is a means to an end, not an end in itself. There is nothing good about sticking to your course for its own sake - especially if it's the wrong course. Look around you always. If you notice that the circumstances that made your goal worth pursuing have changed, ask yourself whether persisting is still your best course of action. And look at yourself. Are your dreams and aspirations still the same, or have they changed so that your goal is no longer as important as other priorities? These internal and external considerations can help you identify whether it's time to walk away by helping you identify whether there is something more important to walk towards. So the decision to quit doesn't have to be a negative one. It can instead be a decision that due to changing circumstances, a new goal is even more important. This is a positive step rather than an act of cowardice - it ensures that your efforts are most likely to deliver results, and that your persistence is applied where it will be most effective. The great economist John Maynard Keynes said: When the facts change, I change my mind. What do you do sir? If you can choose distant goals that provide a unifying purpose for all your actions, you will be able to master Churchillian persistence. A coherent and convergent vision of what you want to achieve provides the best possible framework for persistent effort. Don't call it "quitting" when it's "fitting"
Once you've identified your long-term goals, perseverance and change can co-exist. Your pursuit of your goal is a constant, persistent theme, yet you can adapt and adjust to fit your environment. Just as water always seeks the lowest point but will follow many paths to find it, so you can change course and speed en route to your goal and try many routes, while all the while persisting towards your ultimate destination. I particularly recognise the difference between running towards something and running away from something. The former should most definitely not be perceived as 'quitting' but rather persistently pursuing a positive goal. Even running away isn't necessarily quitting as it all depends on circumstances... if only we could bottle the hindsight which helps each of us to decide which is the right way to go. great topic Ben & a very trivial one indeed. I like your advise on first establishing your long term goals that will then guide your decision to persevere or change course. Many routes can lead to your ultimate destination indeed. And I would add that while striving to get to that destination, take time to stop and smell the flowers, enjoy the scenery & be mindful of the present.